So y’all already know about my cupcake fixation (here + here) but in case you didn’t – well, I ❤ cupcakes. I know, I know, it’s been said that cupcakes are a dying trend, but personally, I don’t think I can ever get enough! They’re portion-controlled moments of sweetness that I just cannot replicate with other food mediums and despite the fact that I do agree that they are overpriced (hah!) I think that also motivates me to savor them for the indulgence that they are. More really is less, y’know? That being said, I just HAD to experience this phenomena of the Ukrops cupcake that had appeared on my radar just last week – as I was reading Young House Love’s wedding recap. See, I am no stranger to paying upwards of $3+ for a delectable sweet treat from a fancy schmancy boutique – and I have been known to plan out special cupcake detours on our vacations, but when I found out that a Richmond-area grocery store had ‘to-die-for’ offerings of their own, I had to seek them out – starting with the internet…. After a quick Google search however, I found that the line of Ukrops grocery stores had in fact been sold in 2010. This worried me…would this mean that my dreams of sinking my teeth into a heavenly white cupcake from their ovens would not be possible? But wait…hadn’t I heard of Ukrops somewhere before…? From there, it was easy to scan Google maps to locate the nearest Martin’s to my other destinations of choice for my trip up to the Richmond/Short Pump area (their Whole Foods is stellar and hello, they have a Trader Joe’s!) so I was back on track. So on July 4th, at around 9 AM, I set off on my adventure, reaching my shopping mecca about an hour later. I decided to hit up Martin’s first – it was very quiet inside, and I was pretty impressed with the store layout (after all, I am a grocery store connoisseur) – I likened the store to a smaller-scale Wegmans. 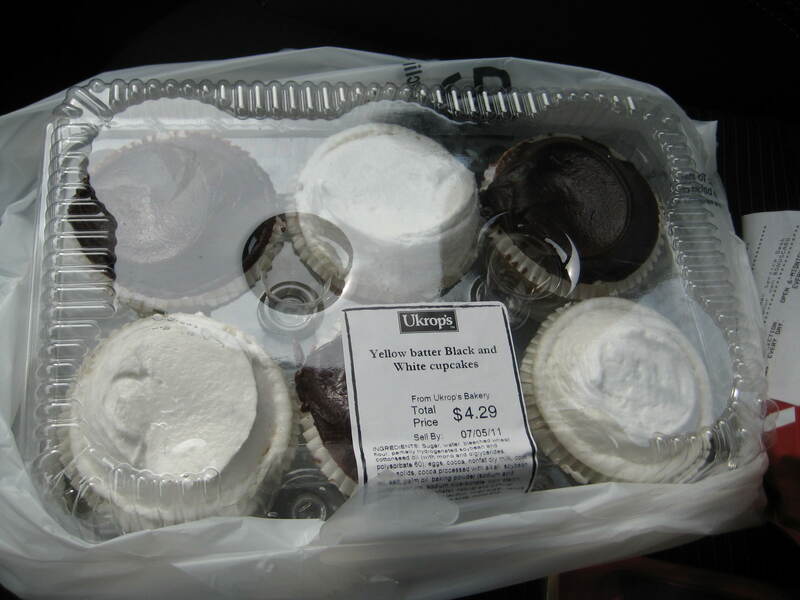 It was easy enough to locate the bakery and I zeroed in immediately on a 6-pack of ‘black and white’ cupcakes – yellow cupcakes with white or black (chocolate) icing. Truly, I was looking for a single-serve, but since it was nowhere to be found (and only $4.70 for 6) I went for it! Since the temperatures were expected to reach the 90’s that day, I knew that it would be imperative for me to sample one before they suffered the fate of melting. Bearing this in mind, I pulled into a Starbucks just down the street, ordered an Iced Coffee and took a seat outdoors to document my experience. 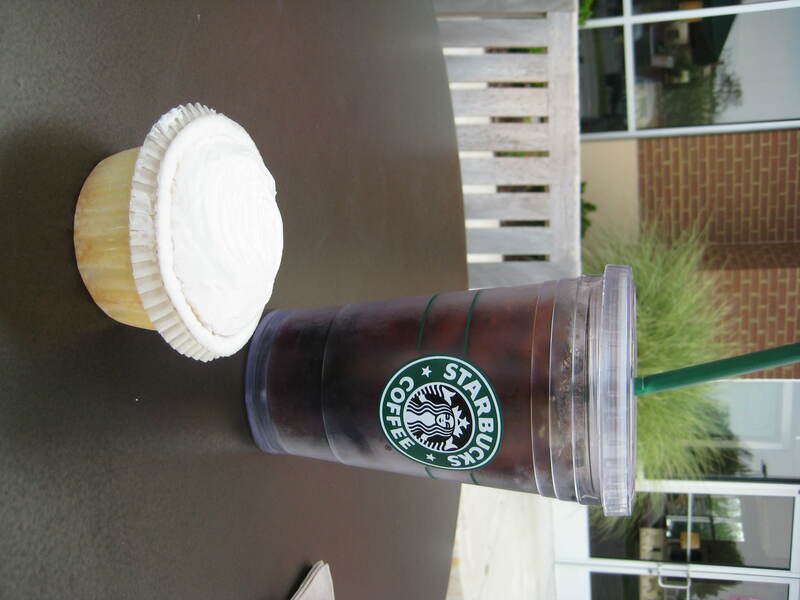 Although I am a true chocoholic, I had come into this expedition with my expectations high about the white-topped cupcake, so that would be my litmus test. Immediately, I was struck by the unusual wrapping and the fluffiness of the icing. Unpeeling the confection, it almost squished – that’s how spongey and moist it was. Pricing it out…$4.29/6 = ~72 cents for this piece of heaven?! It blew my mind. The icing was sweet, but not overpowering and the yellow cake melted in my mouth. A quick check of the ingredients list made my logical mind happy too – it was devoid of the scary indecipherable ingredients that grocery store cupcakes were often guilty of utilizing, in the interest of preservation. 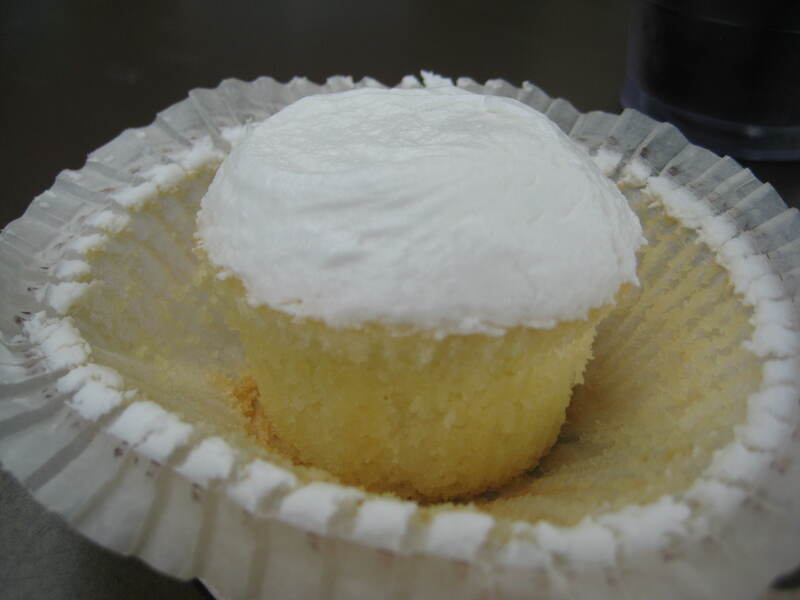 In fact, the “sell by” date was 7/5 – which made me smile, as I recalled a package of cupcakes I had seen sitting on the counter in the office just a few weeks ago that projected their expiration almost a full three weeks after production! But back to that cupcake! The size was perfect for my mid-morning snack, and at 240 calories, it wasn’t a total ‘diet killer,’ either. I mean, I wouldn’t recommend popping back all six in one sitting, but y’know! I went for my second one after a healthy lunch from the WF salad bar (this time, the choco-topped) and it proved just as amazing. Do you have any local/regional favorite foods – from unlikely places? My brother lives near Richmond so I’ve been into Ukrops before – it’s a pretty nice sore, but no Wegmans! The cupcake looks AMAZING though! Agree. Wegmans is so amazing. Not sure if they are as good but there is a Martin’s out here in Waynesboro. I’m guessing Martin’s just bought the Ukrops but they kept the name since it’s a Richmond legacy so to speak. I’m had a couple of things from Martin’s and they have been great! everything about your little shopping outing sounds AMAZING! 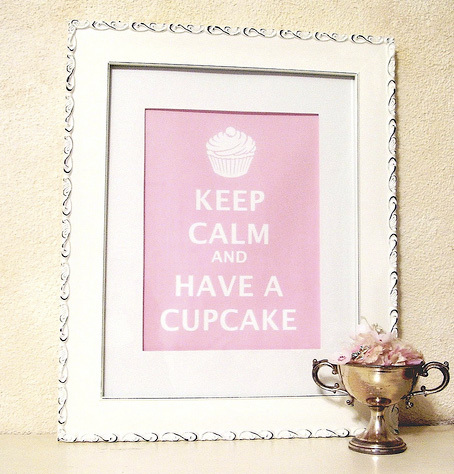 esp the cupcakes! esp since they’re only about 3 quarters each! duuuuude. I always love your comments, Amy! I learn something new everytime. I never would have thought about enhancing a sandwich with salad dressing. What a good idea. I also need to try those pickles next time we are in the midwest because I love pickles. Come visit us in VA one day, we have a Apple Orchard in town!!!! I am looking forward to it in the fall. 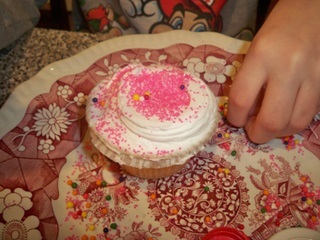 So glad you got to try a Ukrops cupcake! I’m ashamed to admit that we have the same six pack sitting on our counter today! Can’t. Resist. Them. And don’t be ashamed! They were so good I am shocked that they managed to sit on our counter for a couple of days…yummmmm-o!